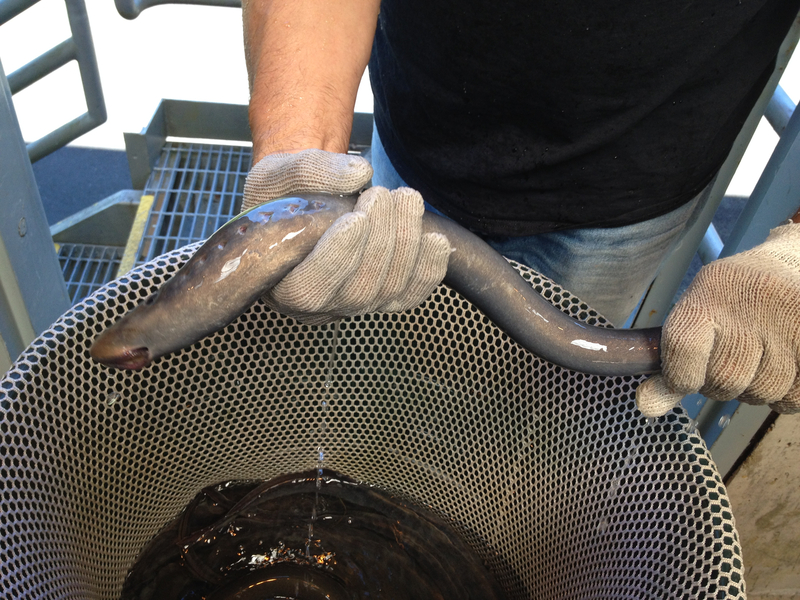 Scientist holding an adult Pacific lamprey collected at Bonneville Dam. The dam is on the Columbia River between the states of Oregon and Washington. Photograph credit: Elena B. Nilsen, USGS. Pacific lamprey are parasitic fish. During their adult phase, they feed on the body fluids and blood of other fishes. During their larval stage they live as filter feeders buried in sediment for up to 7 years. The Portland-based Columbia River Inter-Tribal Fish Commission is the technical support and coordinating agency for fishery management policies of the Columbia River Basin's four treaty tribes: the Confederated Tribes of the Umatilla Indian Reservation, the Confederated Tribes of the Warm Springs Reservation of Oregon, the Confederated Tribes and Bands of the Yakama Nation, and the Nez Perce Tribe. Pesticides, flame retardants, and mercury were present in Pacific lampreys (Entosphenus tridentatus) at levels that may be contributing to their overall decline in the Columbia River Basin. These findings are based on the largest available dataset of contaminants measured in lamprey tissues and lamprey habitats by the U.S. Geological Survey (USGS) and the Columbia River Inter-Tribal Fish Commission (CRITFC). Concentrations of some flame retardants and pesticides were several hundred times higher in larval and juvenile lamprey tissues than in the surrounding sediments. Using samples from Umatilla River Basin, Willamette River Basin, Yakima River Basin, and other Columbia River tributaries, this study provides insight into the bioaccumulation of contaminants in lampreys. Levels of contaminants similar to those measured in larval lampreys during this study have been determined to cause developmental problems in salmonids in other studiesArkoosh, M.R., Boylen, D., Dietrich, J., Anulacion, B.F., GinaYlitalo, Bravo, C.F., Johnson, L.L., Loge, F.J., and Collier, T.K., 2010, Disease susceptibility of salmon exposed to polybrominated diphenyl ethers (PBDEs): Aquatic Toxicology, v. 98, no. 1, p. 51-59, doi:10.1016/j.aquatox.2010.01.013. Johnson, L., Anulacion, B., Arkoosh, M., Olson, O.P., Sloan, C., Sol, S.Y., Spromberg, J., Teel, D.J., Yanagida, G., and Ylitalo, G., 2012, Persistent organic pollutants in juvenile Chinook Salmon in the Columbia River Basin--Implications for stock recovery: Transactions of the American Fisheries Society, v. 142, no. 1, p. 21-40, doi:10.1080/00028487.2012.720627. Johnson, L.L., Ylitalo, G.M., Sloan, C.A., Anulacion, B.F., Kagley, A.N., Arkoosh, M.R., Lundrigan, T.A., Larson, K., Siipola, M., and Collier, T.K., 2007, Persistent organic pollutants in outmigrant juvenile Chinook Salmon from the lower Columbia Estuary, USA: Science of The Total Environment, v. 374, no. 2–3, p. 342-366, doi:10.1016/j.scitotenv.2006.11.051. U.S. Environmental Protection Agency, 2002, Columbia River Basin fish contaminant survey 1996-1998: U.S. Environmental Protection Agency EPA 910-R-02e006, 60 p.
Pacific lampreys are integral to ecosystem health. They provide valuable subsistence resources to tribal communities, bring important marine nutrients into freshwater areas, and serve as a buffer against the predation of juvenile salmon and steelhead by sea lions, terns, and other predators by providing an alternate food source. The research was the result of a multiagency effort among numerous tribes and State and Federal entities. This study was supported by the USGS Cooperative Water Program and CRITFC. Nilsen, E.B., Hapke, W.B., McIlraith, B., and Markovchick, D., 2015, Reconnaissance of contaminants in larval Pacific lamprey (Entosphenus tridentatus) tissues and habitats in the Columbia River Basin, Oregon and Washington, USA: Environmental Pollution, v. 201, p. 121–130, doi:10.1016/j.envpol.2015.03.003. A diagram of the life stages of Pacific lamprey. Adults spawn in freshwater streams, then the larvae live in sediments. Juveniles then migrate to the ocean. After a life in the ocean they return to streams to spawn and die. Pacific lampreys accumulate contaminants while burrowed in sediments filter feeding for the first several years of their life cycle. They can act as vectors for contaminants into freshwater and marine food webs, and to humans, during their migration to the ocean and back to freshwater streams to spawn. Diagram from Nilsen and others, 2015.